After they launched quad Flare 2.0, another quad core phone is set to land on your nearest Cherry Mobile kiosks and stores. After the spotted photo rolled over the web and social media sites, be ready as this new Android phone is coming and may be available today, tomorrow or next week. 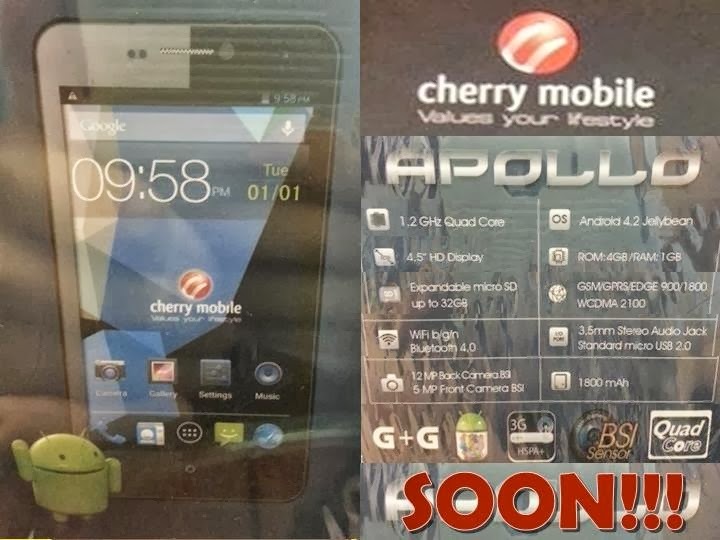 Get your pockets loaded and prepare for Cherry Mobile Apollo launched to be the first to bring home this new buddy. Cherry Mobile has not posted yet the suggested retail price of this handset but few buyers spotted this at the selling price of below 7000 pesos. You can expect lower price of Cherry Mobile Apollo if they’re having a promo or sale during the official launch. What’s good with Cherry Mobile Apollo, it has HD screen so you can really enjoy detailed colors on device UI while smoothly browsing the Jellybean OS. Just like what I want, I has a quad core MediaTek processor (6589) that can handles your favorite HD games. Apollo also can be you’re your social network buddy, it has 12 megapixels camera that can take decent pictures that you can post on your Facebook, Twitter, Instagram and other social networks site. Another plus of this handset is the front camera that offer 5 megapixels selfie shots and for video calling session. The battery of this handset has a higher number of mAh that may last for a day without plugging in to your powerbank or USB port for charging. Battery may promise you more hours of 3G/HSDPA mobile internet and even more with Wi-Fi. inupdate ko ung software update, bmba ram at rom. pnu ibalik sa dati? pls reply.